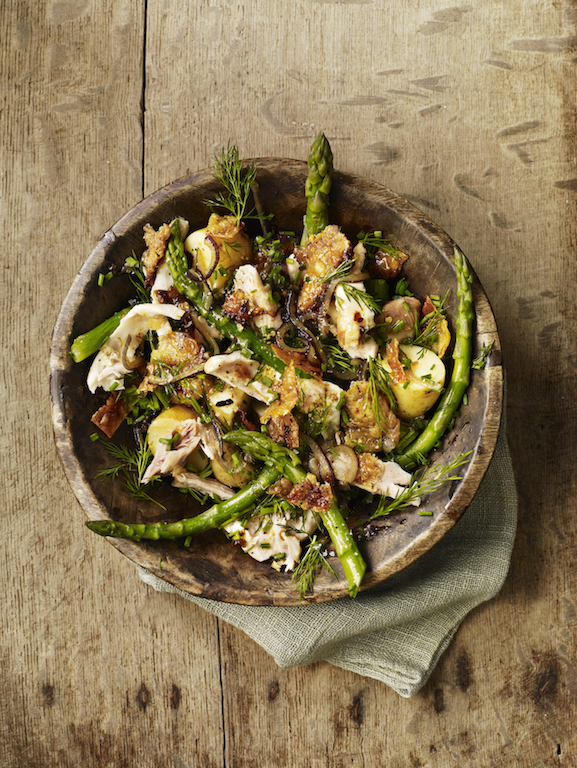 This late-spring salad is full of new-season asparagus, tender chicken and waxy new potatoes. I’ve added a few little anchovies, too; they bring depth of flavour to the salad and team well with the asparagus. Dill and chives, two of my favourite soft herbs, complement the flavours. Heat the oven to 200°C/180°C fan/ gas 6. Put the chicken thighs, skin-side up, in a small roasting tin and drizzle over the olive oil. Tuck the lemon slices under the chicken pieces along with the red onion, then scatter over the thyme and chilli flakes. Season well with salt and pepper and roast for 45 minutes. Remove from the oven and set aside. Meanwhile, cook the potatoes for about 15 minutes in a pan of salted water until just tender. Add the trimmed asparagus to the pan and cook for a further 2-3 minutes. Drain and leave to cool a little. Using 2 forks, shred the chicken from the bones in large pieces. I shred the crispy skin and add it to the salad as well. In a large bowl, mix together the chicken, skin and all the roasting juices (including the onions) with the potatoes, asparagus, anchovies, chives and dill. In a small bowl, mix together all the ingredients for the dressing, then drizzle over the salad and serve.